In the interview held in her office in Seoul on Feb. 3, 2012 the tourism director said that the new campaign will be launched in Seoul in April this year. She also serves as diplomat of the Philippine Embassy in Seoul. Ms. Basco- Ebron is the only tourism official in Seoul who enjoys the status as a diplomat among scores of top tourism directors from the foreign countries. She said that this campaign will help promote the fun attitude and unique culture of the Philippines and its people to the Korean market. Since her arrival in Seoul four and a half years ago she has successfully promoted the Philippines through a variety of PR programs and activities — student fairs, participation in trade shows, T.V, print, as well as through travel agents. Thanks to her achievements for the past five years South Korea has been the top tourist market in the Philippines and has overtaken both Japan and the U.S. In 2011, a total of 930,000 South Koreans visited the Philippines. Thus, Korean tourism in the Philippines has continued to show growth despite the recovery process Philippines are going through due to the global financial meltdown. Ms. Basco- Ebron explained that tourism is the third most important sector only after computers and technology industry and the revenues coming from overseas Filipinos for the nation’s economy. Last year Ms. Basco- Ebron had the chance to visit North Korea for tourism purposes. Her mission was to expand and develop the relationship with North Korea and the Philippines through culture, trading and business. However, the trip was not as successful as it was intended to be. Although some achievements were made in the cultural aspect as Filipinos dancers and musicians will be travelling to North Korea for the spring festival and vice versa. “There were huge buildings, wide roads and a lot of free areas with some similarities to the Russian architecture” she described the landscape of North Korea’s capital, Pyongyang. The Department of Tourism was established in the early 1950’s in the Philippines. The tourism industry aims to encourage, promote, and develop tourism as a major socio-economic activity. Tourism in the Philippines is vital to generate foreign currency and employment in the country. During the interview Director Basco-Ebron gave a detailed explanation about the attractions of Philippine tourism. “The only difference that comes to mind, is that Filipinos don’t particularly like spicy food,” she added. Bilateral relations between the Philippines and South Korea started on March 3, 1949. The friendship was reinforced by the deployment of the Philippine Expeditionary Force to Korea (PEFTOK) during the Korean War (1950-53) in the 1950s. The PEFTOK joined the United States-led 16-nation coalition in helping defend South Korea from the North Korean Communist forces. She explained that the Philippines were instrumental to the rebuilding of South Korean from the ashes of the war. After the war the Filipinos began helping the rebuilding of South Korea. “Both the Japanese and U.S embassies in Seoul were built by the Philippines” said Ms. Basco-Ebron. Boracay is a tropical island located approximately 315 km (200 miles) south of Manila. She mentioned the imbalance of tourists between the two nations. In 2010 only 297,000 Filipinos visited South Korea when 740,622 Koreans went to the island country. “Such a difference is due to the Filipinos now needing a visa to enter Korea therefore making the process much harder,” she explained. Her tourism career began when she started working for foreign affairs as a student studying law in the Philippines. From there she moved on to work at a tourism convention center in Manila. Her first trip to South Korea was back in 1990 and then once again in 1991. Working in the tourism industry back in the Philippine she was able to see the world through her job. 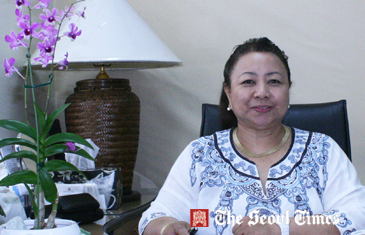 In her own nation Ms. Basco- Ebron was first in charge of the Asia Pacific and Middle East region. 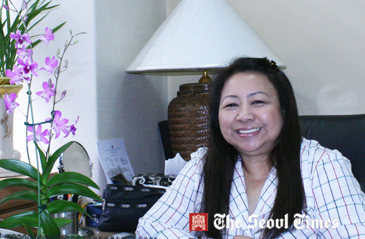 Soon she came to Seoul to work as head of the Philippine Tourism in charge of both Koreas. Her hobbies include bowling which she does twice a week, and her team competes against Filipinos and American competitors. She also enjoys shopping in her spare time. As recently as on Feb. 7, 2012, Ms. Basco- Ebron appeared on Arirang TV’s “Heart to Heart” program in her efforts to better promote the Philippines to the local Korean people. Philippine Department of Tourism (DOT) is currently headed by Tourism Secretary Ramon R. Jimenez Jr. The department was established in the early 1950’s in the Philippines. By 1956 the Board of Travel & Tourist Industry was created. In 1973 Philippine Tourism Authority (PTA) and Philippine Convention Bureau (PCB) were formed by the Philippine government to help expand the role of The Department of Tourism. DOT and PCB were reorganized in 1986 under the executive order. And PCB was renamed Philippine Convention & Visitors Corporation. The DOT is in charge of linkage between Philippine tourism offices around the globe. As the mother unit for communication and directions it monitors overseas offices in different countries. DOT’s plan for 2012 is to further promote the new campaign to foreigners “It’s More Fun in the Philippine.” This promotion is intended to increase the tourist population to around 4.2 million. The new campaign is designed to endorse the fun attitude of the Filipinos, as well to promote their culture. The tourism market is one the major economic enterprises for the Philippine. It is significant for the Philippines to maintain a high rate of tourists coming into the nation. Last year 3,522,887 tourists from around the world visited the Philippines according to the DOT statistics. Currently there are 16 branches of DOT offices worldwide. The top five markets for last year included South Korea, U.S.A, Japan, China, and Taiwan. The most dominant tourist country is South Korea with a total of 930,000 visitors touring the Philippine in 2011. The Philippine Department of Tourism in Korea is run by Ms. Maricon Basco–Ebron. She serves tourism director in charge of both North and South Korea. She is also a diplomat of the Philippine Embassy in Seoul. Due to her dedication South Korea has been the top tourist market in the Philippines for the past five years in a row. South Korea has overtaken other leading countries such as the U.S. and Japan.